Dona Maria lived in San Luis Potosi where he spent his days cooking for a restaurant. It was his occupation that made him become an expert in preparing the mole, and to know what products need to be quality. 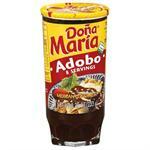 It was more than 55 years he decides to create the first product under the brand name Dona Maria: mole poblano powder. 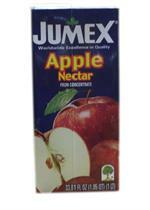 A product that will save you hours in the kitchen and housewives who had the ideal taste. With its success in establishing the first mole paste whose production only took a few minutes. In this he followed the Mole Verde, Adobo Pipián and who had the same widespread acceptance with consumers. 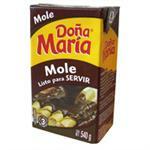 Dona Maria has maintained its original recipe with 100% Mexican ingredients and produce it the traditional way of saving us time in the kitchen, for example, today we also have the Mole Ready to use in Tetra Pak, which only need to heat to enjoy. A few years ago, joins the family the ideal complement Dona Maria: The ONLY chicken broth that Dona Maria is made with chicken and seasonings to taste exactly like a soup made at home. This season also helps us to all the dishes from our table, emphasizing its flavor and replacing salt.